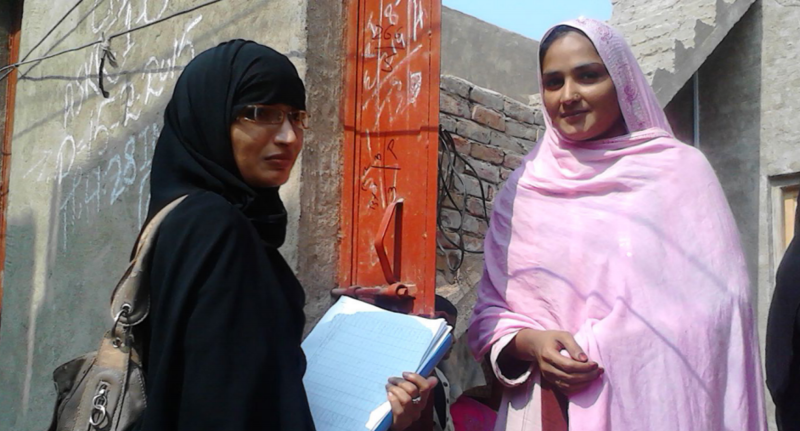 “My name is Rehana and I’m a community health volunteer. I live with my husband and three children in Takar Muhalla Rohri in Sukkur district where culturally women are not allowed to work outside their homes. My husband is a mechanic, barely earning PKR 200 to 300 (£1.50). A few years ago, my best friend’s daughter died of pneumonia and we could not save her due to our lack of understanding and limited access to health facilities. That incident changed my life. I realised I needed to play an effective role in promoting healthcare services in my community. One day, Salma Javed, a BRAC community health worker and also my neighbour, visited and informed me about BRAC’s health programme. She encouraged me to become a health volunteer. I immediately took the opportunity to fulfil my dream of serving my community and joined BRAC as a volunteer. I initially faced many challenges. During household visits, many of the members were not open to share their family details and as a result only few women participated in the health forums. I openly spoke to the household members and over time they started to understand the importance of the health forums. I visit 6 to 8 houses regularly in different communities and collect information on tuberculosis, malaria, antenatal care, post natal care, and immunisation. I inform the community members about the tetanus and immunisation schedule of new born babies. I serve 150 households in my community and have convinced families to send the women to hospitals for child birth. I referred over 17 TB patients to hospital and 65 pregnant women received antenatal care as a result of my referrals.